we were all trapped inside the Clover during the Wednesday night roll-up meeting…….never mind…………. Along with the rain and wind, we also got a hailstorm, and as it stopped poor old Graham had to do his ice bucket challenge – more cubes of ice over his head! This week we finally got the long awaited rain which the course was desperate for – but the severity of the conditions resulted in the course being closed to enable the maintenance staff to clean up. The rains came Monday, Wednesday, Thursday, and have helped to replenish the empty lakes on holes 4 and 5. The bunkers were already in a poor state, but now there is even more work to do. Also sand has washed across the paths restricting access around the course. So no golf to report on this week, but plenty to comment on regarding the effect of the rains. This was the main reason the course had to be closed………….. buggy paths needed to be cleared………………..
replace golf shoes with gum boots?…………. Lots of new pools everywhere but the course does drain fantastically………………………. lots of natural water collection areas sculptured into the course………….. The fairways were flooded but amazingly theses rivers of water has disappeared within an hour of the rains stopping………………. lakes on the 18th fairway……..
All this happened on Thursday, so despite the early morning sunshine on Friday the course was closed. So this meant that golfers could gather in the Clover bar from 9 a.m. to watch the Ryder Cup from start to finish……………. we started off with bacon, sausage and egg sandwiches delivered from the Condado Club by Lynn. and 12 hours later we were eating pizza for supper in the Bulgarian……………. Dave Lloyd is celebrating already……………. no, this was not a ‘yes’ vote for Scottish independence……….. Some local areas managed to miss the storms (the port, Bolnuevo) whilst sadly, there was serious damage only 5 miles down the road in our neighbouring urbanisation of Camposol. Fortunately no one was injured, but the devastation will have proved very costly for homeowners on sector D. Our hearts go out to them and hope nothing like this is allowed to happen again. This was the scene from my patio on Wednesday………….. amazingly there were some golfers still out there who had got a raincheck from Monday, and despite the forecast went out again……………………. This is not a skip in the photo………………….it is a swimming pool liner………………. Late news………………Europe win the Ryder Cup!……………………………………. Seve (on the table) leads the cheers………………. Sorry I can’t comment on this weeks events first hand, as I have been away for a couple of days and did not play or attend the presentation. The weather has started to cool a bit, and 51 players this week for a pairs team event (with one player only marking a card). Three teams tied on a very manageable 43 pts, with places decided on countback. All players blamed their partners for not securing that vital extra point! the scots come in 2nd……. Ken & Alicia were so near……………. Next week is the Apollo Air competition, but with the Ryder Cup starting Friday players should go directly to the Clover to get as much of the action as possible. Hand your completed cards in there, that is where the competitions committee will be. The presentation should follow this, probably at a similar time to normal. Following that we have a very busy schedule in October – the Barry Answer trophy on the 3rd,, society 3 day trip to Alicante on the 6th, Apollo Air on the 10th, Viking Cup on the 22nd and the Seniors major on the 25th. Also there are 3 qualifiers for the Ryder Cup competition at Aguilon during October. These will be on Monday 6th, Wednesday 15th, and Friday 25th. Note 2 of these dates coincide with 2 of our comps. There are entry sheets on the board or contact bookings so we can reserve tee times before they fill up. The fees are: 25€ for one round, and 15€ to play in 2nd or 3rd. Those who qualify for the main game in early November will pay 25€ for 2 rounds (Saturday and Sunday) and will receive a team shirt and free buffet. Lorca are also offering golf with buggy for 30€ until the end of September. 50 players took part in our 3rd ladies day, with 11 ladies in the main competition. Also it was nice to see 20 non-golfing ladies take part in a fun putting competition, with rose cava to follow. The weather was again glorious, although a little hot, but a pleasant breeze helped to make it a fine day for golf. Unfortunately, the course was not in good condition after the hollow tining program carried out last week, and also the bunkers were in a sad state with compacted sand and weeds growing inside the hazards. On a positive note, the fairways had been cut and were immaculate. Lets hope things are put right in the very near future. Dave and Barbara Rollett are back in the UK at the moment, but our thanks go them for providing the cava. In Dave’s absence, vice captain Dave Lloyd managed the event with assistance of president Kevin Smith. Also thanks to Kim Lloyd and Alicia Saunders for all their hard work in organising the evening event and helping Cath Emmett-Smith look after the non-golfers. As is the case every year, we celebrated Cath’s birthday – she was the instigator of this successful tournament. don’t try this at home folks!……..
time for drinks after the putting…………. Kim finished in 2nd place and Alicia 4th (who also won longest drive). Linda was 3rd and the par 3 champion……. Everyone had a great night at the French restaurant in Al Kasar, and we were entertained by Nigel Birchall (Elvis) who performed on the terrace. the ‘king’ in his leather gear serenades Marjike………..
G.I. Elvis sings to his ‘rockahula’ babe………. Next week is a pairs betterball. Look at the previous blog for information on the Aguilon Ryder Cup competition. Just received details of this year’s qualifiers and actual competition date – read below. This years annual match between a U.K. team and our Spanish friends will take place over the weekend of November 8th and 9th. For those wishing to play in the U.K. team there will be 3 qualifying competitions. Thee format is individual stableford with the player having the choice of tees to play from i.e. white,yellow or blue for men and yellow, blue or red for ladies, when the choice is made ALL players MUST use their exact handicap then apply the relevant slope handicap of the tee chosen. The top 26 scores over the 3 rounds will qualify for the U.K. team. To play in one qualifier for non members it will be 25 euros which will include a buggy. For those wishing to play in 2 or 3 qualifiers, the cost for the second and/or third game will be 15 euros including buggy. For those wishing to book tee times please contact me at this email address. Good luck to all those that take part. With our course being closed for hollow tining this weekend, we went back to an old favourite, Desert Springs. Only 35€ with buggy and we have always been welcomed with open arms. The society helped out with the cost of transport, so the coach return trip only cost each player 5€. The journey itself was entertaining to say the least. The spanish coach driver drove down the service road towards Camposol (why?) and then we were asked if anyone knew the way! He did not know where we were going, or how to get there! The quickest way was down the A7, but for some strange reason he headed for the toll road AP7, joining it halfway to Aguilas instead of the junction just beyond Camposol. This took 40 minutes just to reach the toll road, Last time we went it took just over an hour for the complete journey. Coming off the toll road we went in completely the wrong direction, and after 2 stops to ask the way finally arrived after 2 hours, being 20 minutes late for our first tee time. To add insult to injury, the driver had no money on him, so Ray Vivian had to pay the toll, and on arrival he also asked for some money for fuel! Honestly a professional company who do not provide a sat nav for their driver! We played a 1,2,3 waltz and all the golfers enjoyed the day with the course being in excellent condition. Most of the scores were quite close, but the team of Jim Alwell, Ray Vivian, Paul Harrington and Ken Saunders romped home by 8 shots. Left to right…..captain Dave Rollett, Ken, Paul, organise Graham White, Ray, and King Jim on the throne………..
Dave, Graham, Colin and Lynda Lloyd were 2nd………. Les’s team came in 3rd………..
Nice to see Torkild in the prizes………. 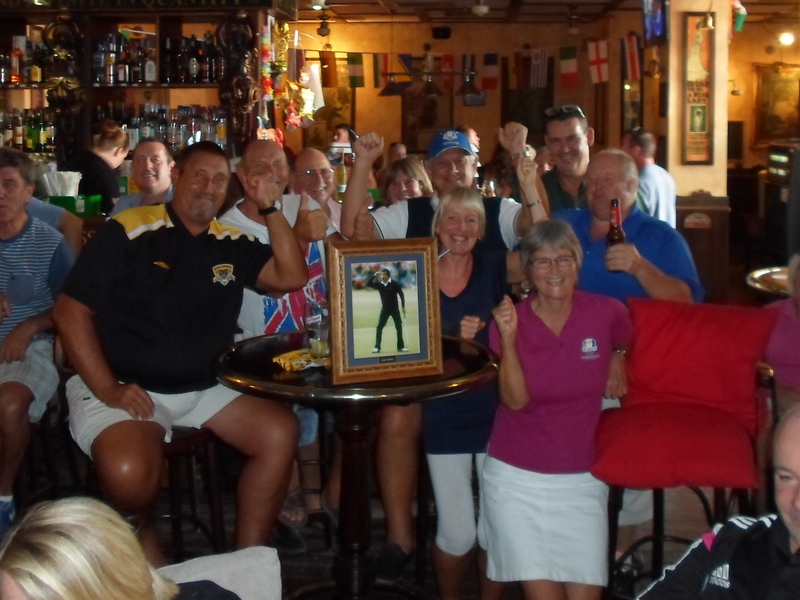 Terry Burgess won a bottle of whisky for nearest the pin on the 2nd……….he kindly passed it around the bus on the way home……. Myself and Kristin needed a break by the 3rd tee………..
Dave pays a visit to the flying horse……. finally the 18th, and Jan’s drive just went to far and into the lake……. Graham had a hard day, looks like whisky finished him off……..
After getting off the bus it was straight to the Clover, and the whisky took effect………………..
the boys dancing around the handbag………. Jim is revived and fancied going for it with Jostein………. Non golfing ladies meet at clubhouse 12.30 for putting competition and drinks…. Due to entertainment licence restrictions, we are unable to have a singer outside in the Al Kasar, but there should be something happening inside the Clover. One of our members has decided to sell his IRM golf rights membership, which covers all six courses. It is on offer at 7000€ with aprox 21 years remaining, which sounds a great deal. Initially the cost was about 20000€ for 25 year membership. If anyone is seriously interested, contact me at barry@cdagolf.com. I will put you in touch with the seller. I have always loved the Edinburgh fringe, with great comedians (both famous and unknown) so here’s the short list for joke of the festival in 2014 (Tim Vine won, he also won in 2010 and finished 2nd twice since). Notice they are all quick one-liners? 1. I’ve decided to sell my Hoover… well, it was just collecting dust” – Tim Vine. 2. “I’ve written a joke about a fat badger, but I couldn’t fit it into my set” – Masai Graham. 3. “Always leave them wanting more, my uncle used to say to me. Which is why he lost his job in disaster relief” – Mark Watson. 4. “I was given some Sudoku toilet paper. It didn’t work. You could only fill it in with number ones and number twos” – Bec Hill. 5. “I wanted to do a show about feminism. But my husband wouldn’t let me” – Ria Lina. 6. “Money can’t buy you happiness? Well, check this out, I bought myself a Happy Meal” – Paul F Taylor. 7. “Scotland had oil, but it’s running out thanks to all that deep frying” – Scott Capurro.